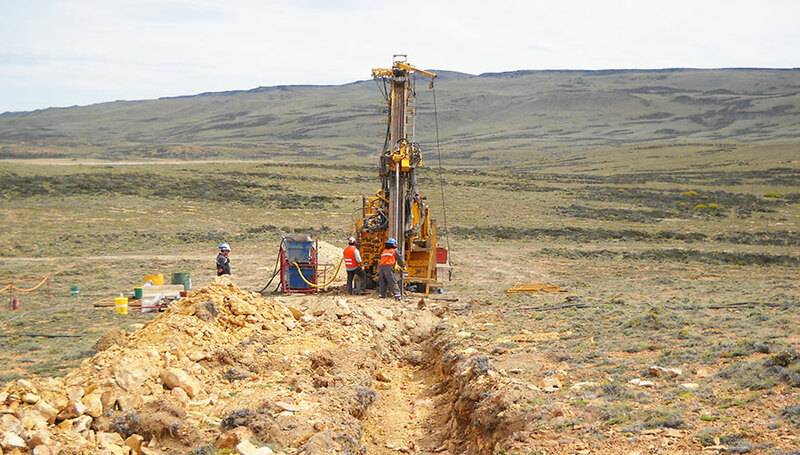 Sarita is a 100%-owned project located in the SW of the Deseado Massif, an area recognised for high grade epithermal silver mineralisation. The project is situated 10 km along strike to the NW from the Mina Martha silver mine (Hunt Mining Corporation) and 25 km from the Manantial Espejo mine (Pan American Silver Corporation). The project was acquired from Barrick Gold Corporation during 2007. The Sarita project comprises a central rhylotic flow-dome complex located within a swarm of NW-SE striking, steeply dipping low-sulfidation style banded quartz veins hosted within shallow dipping dacitic to rhyolitic pyroclastic deposits of the Jurassic Age Chon Aike Formation. 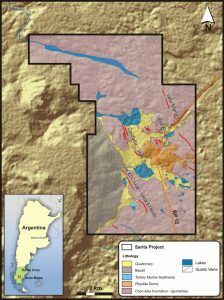 Geologically the area displays very similar structural and stratigraphic characteristics to Mina Martha located further to the south-east, with Ag rich, polymetallic, vein hosted intermediate sulfidation style mineralisation typical of the district. NW-SE striking lineaments can be traced between Sarita and Mina Martha. Both Sarita and Mina Martha projects are interpreted to be located on the margin of a large caldera structure. Several discrete mineralised corridors hosting persistent quartz veins/breccias in NW-trending structures have been identified. The total length of the mapped structures is approximately 10 km, within a 4 km wide structural corridor, and include quartz veins, veinlets, stockworks and quartz vein-breccia structures associated to WNW faulting and silica/illite (+/- adularia) alteration. Textures are represented by colloform/crustiform, comb, CRT, cockade, massive, ochreous and zoned quartz. Precious and base-metal mineralisation has been recognised in quartz veins-breccias up to 3 metres wide at surface, composed of quartz + sulphides. Rock chips from discrete vein structures or aligned float have returned anomalous gold samples with up to 83.40 ppm Au and up to 15,444 ppm Ag, in separate samples; as well as several samples with > 1 per cent copper. Mapping, channel sampling, trenching, Gradient Array IP and ground magnetic surveys, and 29 drill holes for a total of 3,469 m. The majority of the exploration activity has focused on the central dome complex intersecting broad zones of low grade silver-gold mineralisation. More than 10 km of quartz veins have been mapped in the southern sector of the project only with rock chip samples reporting gold values to 83 ppm and silver to 15,444 ppm from the quartz vein system. To date, only 16 short drill holes have targeted the vein system. High grade vein-hosted low-sulfidation silver mineralisation and low grade Las Calandrias-style dome-hosted mineralisation. More than 10 km of veins to be evaluated.